in the works of Philip Roth, Saul Bellow, and their contemporaries. word to describe this inventive novel. Normal0falsefalsefalseEN-GBX-NONEX-NONEMicrosoftInternetExplorer4 A neurotic writer's novel begins to come to life as he struggles to save his marriage and his fledgling career. When Yuvi's wife finds him in his underwear, standing on top of his desk, she isn't terribly impressed with him and his writing habits. But Yuvi worries. He has a wife who wants things he can't give, an editor who wants a book he can't deliver, a brother-in-law with a gut disease that he can't fix, and dead parents who stubbornly remain dead. As the structure of Yuvi's novel falls apart, so does his life. His novel and his life blend together as he struggles to pull out of the mess. He revisits the fragments of his unreconciled past and his pantsless present, traveling from his suburban Jewish home in Atlanta to the North Carolina mountains of his father's childhood, to several hospital waiting rooms, to the living room of a grieving Palestinian man. 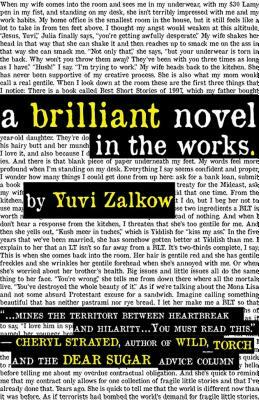 Heartbreaking and hilarious, A Brilliant Novel in the Works is the utterly original debut novel from Yuvi Zalkow. Yuvi Zalkow's stories have been published in Glimmer Train, Narrative Magazine, Carve Magazine, and others. He received an MFA from Antioch University. He lives in Portland, OR and is hard at work on his second novel.